When I visited Graceland as a 15-year-old in 1990, I remember drooling over those Elvis In Concert jackets in a souvenir shop. Price tag was out of my league, as I recall. Or maybe it would have taken my entire souvenir fund, which I wasn't willing to give up for just one item. That was also during a period when it wasn't cool to like Elvis (really, how can there ever be such a time?!?!? ), but I probably would have worn it anyways. I always kind of marched to the beat of my own drummer, whether Fontana or Tutt. 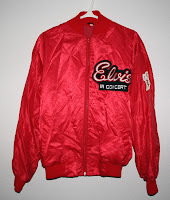 Uhh, Tygrrius, now I really feel totally spineless for not wearing my Elvis In Concert jacket to school. But to my defence I have to say I wore an Elvis badge on the sleeve on my jeans jacket, something I took a lot of harassment for. And looking back, I'm proud of the way I kept sticking to Elvis while everybody was telling me how lame that was. I even remember hearing stupid comments while browsing through Elvis albums in a record shop. As you say, how could there be such a time?! Then gradually, starting in the early 90's it was suddenly cool to dig Elvis. My guess is that it had something to do with the 50's box set and what followed after that. And when "A Little Less Conversation" became a number one hit about ten years after that, well then I was on top of the world, and finally felt that the people around me understood at least something about Elvis' greatness.